Success. It���s all in the navigation. 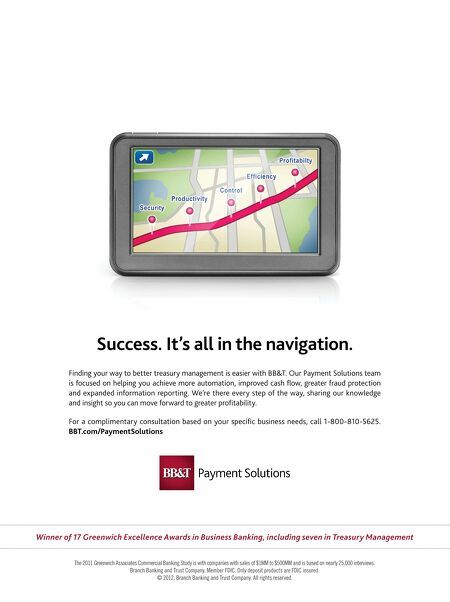 Finding your way to better treasury management is easier with BB&T. Our Payment Solutions team is focused on helping you achieve more automation, improved cash fow, greater fraud protection and expanded information reporting. We���re there every step of the way, sharing our knowledge and insight so you can move forward to greater proftability. For a complimentary consultation based on your specifc business needs, call 1-800-810-5625. BBT.com/PaymentSolutions Winner of 17 Greenwich Excellence Awards in Business Banking, including seven in Treasury Management The 2011 Greenwich Associates Commercial Banking Study is with companies with sales of $1MM to $500MM and is based on nearly 25,000 interviews. Branch Banking and Trust Company, Member FDIC. Only deposit products are FDIC insured. �� 2012, Branch Banking and Trust Company. All rights reserved.